The Queen of Grip-lit is back… ‘A terrific story, originally told. All hail the new Queen of Crime!’ HEAT ‘A web of a plot that twists and turns and keeps the reader on the edge of their seat. This formidable debut is a page-turner, but don’t read it before bed if you’re easily spooked!’ SUN THE TRUTH WON’T STAY LOCKED UP FOREVER When a burned body is found in a disused signal box, suspicion falls on lonely teenager Gabriel Webb. There’s no doubt he was at the scene of the crime, but does he really deserve what awaits him in prison? DS Imogen Grey is certain there’s more to the case than meets the eye. But while she struggles to convince those around her of the truth, her partner DS Adrian Miles is distracted by his own demons. When a brutal double murder is reported, their investigation is stopped in its tracks. Is the body in the box even who they thought it was? The duo realise Gabriel might have been locked up for a crime he didn’t commit. But with enemies watching Gabriel’s every move, they may be too late. Miles and Grey are back in the thrilling new novel from bestselling author Katerina Diamond, perfect for fans of Karin Slaughter and M.J. Arlidge. Very gripping read hard to put down with a bit of everything in the story. Just as good as her other two! Couldn't put it down. Definetly recommended. 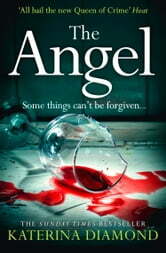 The Angel by Katerina Diamond is the 3rd book in the Imogen Grey series. Series Background: (Warning – May contain spoilers from previous books) DS Imogen Grey has put her past behind her and settled into her new precinct. She has even learned to trust her partner DS Adrian Miles. Although they don’t always play by the rules, they are both top-notch detectives, and have become friends. Imogen has recently discovered the identity of her father. Miles has recently discovered that his ex-wife’s husband should be behind bars. My Synopsis: 19-year old Gabriel Webb ends up in jail for starting a fire in an abandoned train signal station. The burnt body of a man found in the building makes it manslaughter. Gabriel is not prepared for prison, and a man named Asher is about to make it a really unpleasant experience. An elderly couple are savagely beaten and killed, their murder plastered over the web for all to see. There seems to be no motive for the crime. Imogen and Adrian enlist the help of Gary Tunney, the police forensic computer technician, to look into the couple’s financial situation, and that of their son, the sole beneficiary. What he finds is perplexing. Gary has also been secretly looking into Dominic’s business activity for Adrian. Dominic is the sleaze married to Adrian’s ex. That information is somewhat perplexing as well. Their new boss, DCI Mira Kapoor is still an unknown entity. Neither Imogen nor Adrian know whether they can trust her. They’ve both been burned by their superiors before. Meanwhile. Imogen knows her relationship with Dean, an ex-con, would be frowned upon by the force, and probably affect her chance of promotion, but she’s not sure she cares right now. She is aware, however, that she will have to make a decision soon. She worries about his propensity towards violence and hopes that is in the past. Adrian, too, has found someone. It’s been a long time since he has felt like this. My Opinions: First, it is important you read the first two books before jumping into this one. I love the relationship that is building between Imogen and Adrian. They are really starting to rely on each other. It feels like a true friendship. I like how part of the story is told from Gabriel’s perspective, as a first-time offender in a prison environment. I think the author showed his fears and reactions to his situation quite well. Everything felt very real. This book really ties up some loose ends from previous books, but still left the reader with the question “but what happens next?” There are a lot of characters in this, but due to the smooth writing, everything is clear. Katrina Diamond writes exceptional prose, with deep characters, wonderful plots, and enough twists that you have to pay attention. I highly recommend this series!